The Good Times Blog: Those aren't flip flops Mr. Russo, they're balloons for a party! Those aren't flip flops Mr. Russo, they're balloons for a party! George W. Bush (9/15/06): "And that's the way I will continue to conduct the war. I'll listen to generals." So to my surprise what headline do I read in the Washington Post today? With Iraq Speech, Bush Breaks With Generals. 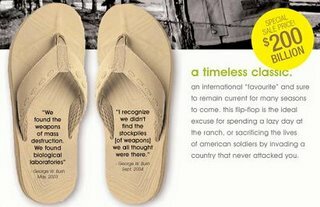 John Kerry is the King of the Flipping Floppers. Hey! A comment from one of the 30% of the country that is still clinging to the idea that it was the right idea to re-elect W. Intelligent comment too.